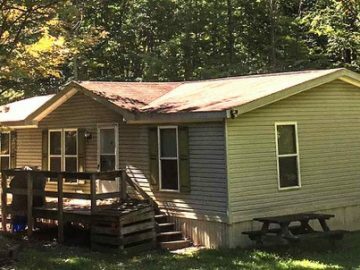 Peaceful, fully furnished 3-bedroom, 2-full baths cabin surrounded by 5 beautiful acres near the Pennsylvania Grand Canyon, Pine Creek Rail Trail, and other area attractions. Sleeps 10 comfortably, fully-equipped kitchen with microwave, coffee maker, and refrigerator, free Wi-Fi, Cable TV, Blu-ray DVD player, washer and dryer, huge tub in master bedroom, disabilities access, linens not provided. Route 6 east of Wellsboro, one mile on Shumway Hill Road.